Perfect for Fall, this french onion tart is a must just plain delicious. Though the French lost out to the Spaniards in their efforts of empire-building in Texas, we nonetheless enjoy their lasting influence on our cuisine. Our traditional wheat roll, bolillo, is French, as is of course the French bread we use in Capirotada. Conversely, French cuisine was forever changed by the Americas. For example, what would Jacque Pepin do without our tomatoes? The pissaladière is a perfect example of French country cuisine, straightforward but oh so complex. I first learned about the pissaladière in southern France, but it was Chef Paul Sartory, faculty at the CIA, San Antonio, who pointed out that it is technique (v.g. pastry making, slow cooking in oil) that makes this dish absolutely simple and also very rich. You might say that he helped me see that technique and ingredients are two sides of the same tart! I’ve served pissaladière often as an appetizer and it is absolutely delicious. It also looks hearty and earthy with those black olives and anchovies. This recipe uses a pastry crust where most will use a crust made with yeast, similar of course to its cousin, the pizza.No, we don’t have this dish in Texas. I include it here because often we forget that it was not only the Spanish but also the French who interacted with native Texas Indians. 1. Cook the onions in the olive oil on very low heat, covered, until they are soft. Uncover them and continue cooking until all the liquid evaporates. Be patient. You are developing the rich flavor. Be careful that they do not brown with too high heat. 2. Add the chopped thyme, salt and pepper and set aside. 5. Add the salt and then enough of the water to form a dough. Work the dough as little as possible to avoid gluten formation which always destroys flakiness. 7. Place the dough on a lightly oiled tart pan and crimp the edges as in the picture. 8. 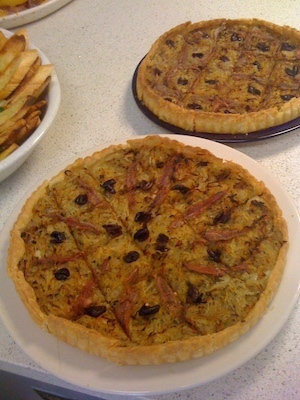 Spread the onions over the tart and then arrange the olives and anchovies decoratively. In the picture I’ve done it two ways. 9. Drizzle a little extra virgin olive oil all over the surface and bake for about 30 minutes or until the edges of the pastry are golden and crisp. Let me know how your guests like this if you make it. ¡Buen Provecho!